"If not that I am feeding you, you will not be able to eat, I am your supplier so be careful the way you behave in this house". Biola got on her knees and apologised to her uncle; "I am sorry uncle Tunde"
Biola was an orphan; her uncle took her in when her parents died. He was unmarried at the time but 2 years later, he got married to a lady called Nneka. Nneka hated Biola and maltreated her, she would starve her and call her all sorts of names yet when Biola's uncle came back from work, Nneka would become so nice. Nneka began to feed her husband false stories about Biola; she would accuse her of stealing money and talking back at her. Finally Tunde asked Biola to leave his house, she had nowhere to go but she knew there was a God in heaven who had been taking care of her since her parents died. Biola began to pray as she walked down the street, she was so lost in prayers that she did not notice the car that parked in front of her. An elderly man and woman got out of the car and called her by name, she didn't know them so she was very surprised. They hugged her and introduced themselves; they were friends to her late parents and they only just left her uncle's house who told them that they would find her down the street. These couple had been childless all their lives and they had decided to adopt Biola as their daughter. Beloved, is there anyone playing God in your life? Who is that person that believes you will not survive without them? Who is threatening to stop paying your school fees? Who is the boss threatening to fire you? Let them do their worst! The bible says in Isaiah 41:17 (NIV) "When the poor and needy search for water and there is none, and their tongues are parched from thirst, then I, the LORD, will answer them. I, the God of Israel, will never abandon them. When man reaches the end of himself is when God begins! God is your source! Your parents, boss, husband, uncle, bankers are just resources. If all of them decide to cut off, God will open another way! If it will take Him to move another company to Nigeria, He will do it, if it will take Him to use a total stranger, He will do it. 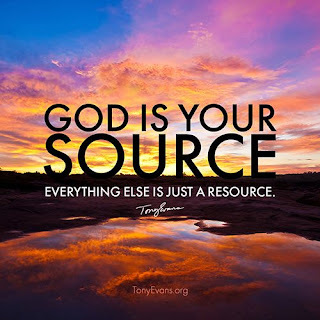 God is a responsible Father and a Jehovah Jireh, He will provide! You can take that word to the bank, as long as you are looking up to God, He will never fail you.